Mobile banking apps have come a long way. Once upon a time, features like mobile check deposit were considered cutting edge. Now, consumers have come to expect that kind of functionality – along with seamless money transfers, bill pay, ATM locators and more. So what is now considered cutting edge? Some apps let you track accounts from different financial institutions. Others offer built-in financial wellness and budgeting platforms. Some even turn your mobile device into a digital wallet. It’s an exciting time in the world of mobile banking, and if mobile offerings are a deciding factor for you in choosing a bank, we’ve assembled this list of the best banking apps. Note that we’ve provided the apps’ user ratings on the Apple App Store and Google Play Store; they are current as of the time of this publication. Ally Bank stands as one of the leading institutions in the world of online bank. So it’s no surprise that the bank focuses on offering the best mobile banking experience it can. It also offers a clean and user-friendly interface. You can store your password and log-in using your fingerprint. Once logged in, you can track all of your accounts directly from your mobile device. That means you can keep tabs on everything from your savings account to your certificate of deposit (CD) to your individual retirement account (IRA). You can even trade stocks and track investment performance via your mobile phone. While you’re at it, the Ally Bank app offers the latest market news to help you make the best investment decisions from the comfort of your living room. And Ally also has you covered with easy access to your statements and tax forms. In addition, the Ally app gives you free access to Zelle®. Similar to services like Venmo® and PayPal®, this feature lets you transfer funds to others using just their email address and phone number. So there’s no need to exchange personal account information like bank account and routing numbers. 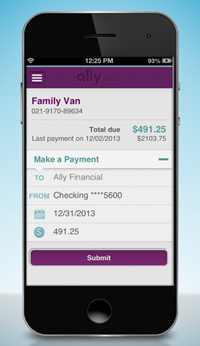 The Ally Bank app also allows you to download a built-in application called Card Control. This allows you to customize your debit card. For instance, you can set spending limits and control notifications. J.D. Power recently awarded the Capital One mobile banking app with the coveted title of “Highest in Customer Satisfaction Among Mobile Banking Apps.” The people agree, with Apple and Android users both giving the app a solid 4.7/5 star rating on the Google Play store at the time of this writing. And with its load of functionalities, it’s no surprise. 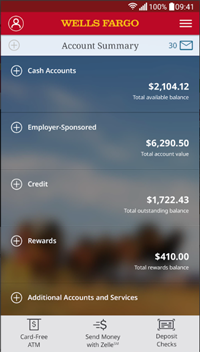 The Capital One app lets you view all of your accounts including home and auto loans. You can also keep track of your credit score and redeem credit card rewards. To keep track of your purchase and credit history, you can set up instant push notifications. And if you lose or misplace your Capital One card, you can easily lock it with a few taps on your phone. This ensures nobody has access to your money until you turn the card back on. In case you can’t find it, you can report fraud directly from the app. Furthermore, Capital One covers a large mobile footprint. You can access your accounts via the Apple Watch for example. And you can securely log in via your phone by using your fingerprint. J.D. Power also recognized Bank of America for customer satisfaction. But where this app really stands out is in security. You can establish travel notices for eligible accounts, so you don’t experience any lack of access to your funds while away from home. You can also activate your card or order a replacement one directly from the app. And if the bank detects suspicious activity, they will contact you so you can verify transaction activity. In addition, you won’t be held liable for fraudulent mobile banking transactions when you notify Bank of America within 60 days of the transaction first showing up on your statement. Simple stormed onto the banking scene as an online-only entity with a mission to make mobile banking as easy as possible. And while the bank currently doesn’t offer much in the way of account variety, it stays on top of its mobile and online banking game. The app offers a wealth of built-in money management features. For instance, you can calculate a budget directly within the app. Its “Safe-to-Spend” component will then tell you how much money you have left after setting aside cash for bills and necessities. This helps you get a real glimpse of what your “Available Balance” really is. 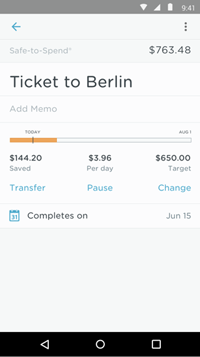 Plus, the app allows you create digital envelopes to meet your savings goals. It will even determine how much you have to set aside at different time intervals to meet those goals. You can also put your savings on auto-pilot by instructing the app to set a little aside every day in order to help you meet different savings targets. Of course, as with any banking app you have access to your entire balance at any time. But it’s those built-in financial management tools that really make the app stand out. It’s important to note, however, that we rated Simple for its mobile and online banking features. Our research found that these ranked very high in user satisfaction. However, we also found a high number of negative user reviews regarding customer support. It also may not be the best if you move around frequently, as you need a physical address in order for the bank to send you a card. In case you lose it while traveling, you may encounter some issues. Wells Fargo offers more than just your basic checking and savings accounts. You can also invest in various securities like stocks and mutual funds. And the Wells Fargo app lets you easily track your investments and open orders for your Wells Fargo Advisors and Wells Trade accounts. In addition, the app offers real-time quotes, market data and graphics to guide you in your investment decision-making and asset allocation. And to stay safe, the app lets you set up alerts via text or email. Another notable feature that helps the Wells Fargo app beat the competition is its cardless ATM access option. You don’t even need to carry your card around to access your money via thousands of ATMs. You can just use your mobile phone. Just keep in mind that some ATMs might be inside locations that require a card for after-hours entry. Unlike most major bank apps, the Chase app allows you to reload your Chase Liquid debit card. In fact, it offers access to most of your accounts including checking, savings, and credit card options as well as investments. You can also easily manage your payments online. 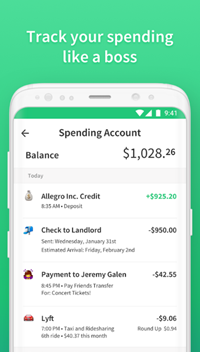 The Chase app allows you to pay bills, transfer money to friends via Zelle, and schedule payments for your credit card, mortgage or other loans. 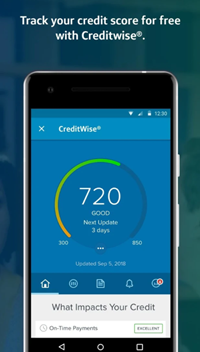 You can also see your TransUnion credit score in the app. And if you have one of Chase’s popular rewards credit cards, you can also view and redeem your Ultimate Rewards through the app. Chime recently stepped into the banking arena as an online-only entity. And it brought a stellar mobile banking app with it. 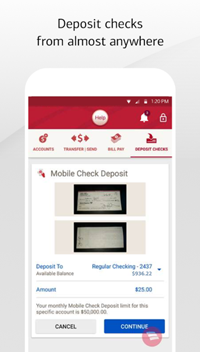 Truly designed for the digital age, Chime offers one of the best user experiences we’ve seen on a mobile banking app. But it’s more than just a pretty looking app. In fact, you can substitute it as your debit card to access your funds via more than 30,000 fee-free ATMs in the national MoneyPass network. In addition, you can set up daily balance alerts and real time transaction notifications. And to really put the icing on the cake, Chime Bank gives you access to your direct deposit up to two days early in certain situations. At the time of this writing, both Apple and Android users gave it high ratings. 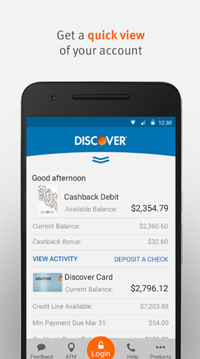 Discover offers all the mobile banking app bells and whistles you’d expect from a huge financial institution. However, it goes a step further by providing its clients with Discover Deals. This in-app marketplace offers deals on the latest brands. So the Discover app stands a solid option for all you serial shoppers and bargain hunters out there. In addition, you can redeem your credit card rewards through the app. You’ll also be able to check your FICO credit score, and iPhone users can add their Discover cards to their Apple Pay Wallet right from the app. 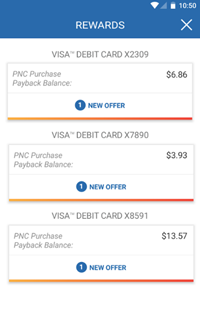 If you don’t like to carry your card around or often forget to bring it with you, the PNC mobile banking app may be right for you. While some banking apps let you use your phone as your debit card, PNC Bank extends access to your credit and SamrtAcess Cards. With this app, you’ll never have to worry about not being able to make a purchase because you misplaced or lost your card. At time of this writing, Apple customers gave the PNC mobile banking app a near-perfect score of 4.8/5 stars on the iTunes store. Charles Schwab has long been recognized as a giant in the brokerage industry, but it also runs a banking arm. 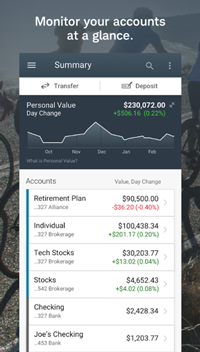 And it delivers a powerful app that brings together all your financials, from your checking account to your 401(k). You can use the app to open new accounts, trade everything from stocks to exchange-traded funds (ETFs) and access real-time market data right from your mobile device. In addition, its built-in Media Center provides you with Charles Schwab videos, podcasts and more. Overall, it’s a must for Charles Schwab clients with multiple accounts and a very useful tool for investors interested in opening one. The world of mobile banking is an ever-expanding one, and you can bet that consumer demand will drive its future. You can also count on tech-focused banks to invest heavily in improving their products. But with so many options out there, you have to ask yourself what you really want out of a banking app. 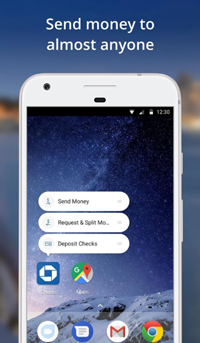 Do you like access to multiple accounts and being able to turn your phone into a digital wallet? Or do you value security above all? What about being able to trade stocks and make other investments? Whatever feature you find most appealing, there’s an app for you. Some banks offer superior digital and mobile banking offerings compared to others, so shop around and see what works best for you. And of course, apps and websites are just one small piece of the puzzle – you’ll also want to make sure you’re getting a good interest rate. To give you some additional insight, check out our report on the Best Banks in America. Ready to go beyond bank accounts and build a plan to meet your larger financial goals? Our SmartAsset Financial Advisor Matching tool links you with up to three local advisors who can help you meet all your goals, from paying off debt to saving for retirement.